Government-owned UDA Holdings Bhd's priority for the long term is to enhance the value of its properties with an optimum Bumiputera and non-Bumiputera mix of buyers and tenants to ensure their appreciation. Newly-minted UDA Holdings chairman Datuk Nur Jazlan Mohamed said the organisation needs to change its concept of promoting mainly Bumiputera interest to ensure a favourable mix with higher purchasing power in order to be a profitable developer. "We need to change the expectation that properties developed by UDA are 100 per cent, or even 80 per cent, for Bumiputeras. "It is better not to have a fixed quota for Bumiputera properties, but yet maintain the Bumiputera agenda for it to be an effective business model," Nur Jazlan told Business Times when met in Johor Baru recently. He admitted that there were Bumiputeras who sold off their properties for a quick profit to non-Bumiputeras after purchasing them from UDA Holdings at preferential prices. "Many of UDA Holdings' properties are freehold and the Bumiputeras who benefited from us should have the moral integrity to not sell them to non-Bumiputeras. "Our priority for Bumiputeras is not only about providing residential and retail opportunities, but also to ensure that those properties stay in Bumiputera hands while the value increases in the long-term." 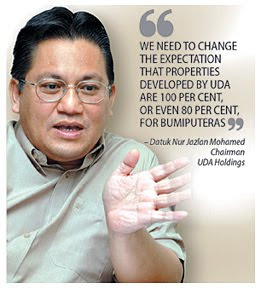 Nur Jazlan stressed that UDA Holdings must make a profit first before it can realise its Bumiputera agenda as many of the Bumiputera properties are subsidised by as much as 15 per cent. He said the first rule of thumb in sustaining a successful business model was: "If you don't make money, then there is no money to give out." Nur Jazlan said that perception must change in the face of new socio-economic challenges. "We need to understand that the purchasing power of Bumiputeras today is still limited as most of them are civil servants with fixed incomes. At the same time, the success and value of a development is dependent on the target market. "So it is important to have a good mix of buyers and tenants to improve the value of the property." Nur Jazlan cited the BB Plaza in Bukit Bintang, Kuala Lumpur, that is under the company as an example to indicate the importance of having a healthy mix of tenants. He said the adjacent Sungai Wang Plaza, acquired and renovated by Singapore-based property developer CapitaLand, was enjoying a 20 per cent higher rental yield compared to BB Plaza. Nur Jazlan suggested that an equity break-up could be as much as 60 per cent Bumiputera and 40 per cent non-Bumiputera, or even an equal 50 per cent, to be healthy. He believes that such a proposal can improve the property value and is in line with the 1Malaysia concept, without UDA Holdings losing sight of its goal of promoting Bumiputera participation.